The Syrian American Medical Society does not stand alone in its efforts to support Syrians in need. Many NGOs representing the Syrian Diaspora communities in the world and International NGOs have contributed to the relief operations. Coordination, collaboration and partnership are essential tools to avoid duplication and waste, increase capacity and cover the needs of local populations and refugees. SAMS has been coordinating its efforts partnering with many local Syrian NGOs, US-based NGOs like Karam Foundation, SRD and SSF, Syrian Diaspora NGOs like Syrian Expatriate Medical Association and Syrian British Medical Society and International NGOs, like ICRC, IRC and the UN agencies. American Relief Coalition for Syria: SAMS is a founding member of this US-based coalition of 13 relief organizations providing services in Syria and for Syrian refugees. The Coalition provides advocacy, coordination and networking for its members. By pooling the talents and expertise of hundreds of professionals, ARCS members cover most fields of relief and development including food & clothing programs, shelter, medical aid, education, women’s programs, refugee assistance, and sustainable giving programs. In the past two years, ARCS has contributed collectively more than $110 million in humanitarian and medical relief. #WithSyria Coalition: The #WithSyria Coalition is a group of over 130 organizations from around the world that stand with Syrians caught in the conflict. This coalition is facilitated by Crisis Action, and provides key media, advocacy, and public engagement work to highlight the needs of Syrian civilians. SAMS is on the Steering Committee for the #WithSyria Coalition. Syria Relief Network: SAMS is also a founding member of this coalition of more than 60 Syrian NGOs in different areas of relief. The goals of the coalition are to provide advocacy, coordination, representation, and advocacy on behalf of its members. Safeguarding Healthcare Coalition: SAMS is a member of this global coalition to protect healthcare workers in the time of conflict. The coalition includes Johns Hopkins Public Healthcare Center, ICRC, and Physicians for Human Rights, World Medical Association and WHO among other members. 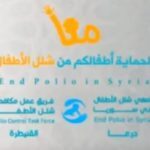 Polio Control Task Force: SAMS is a founding member of this Taskforce that was formed by 8 Syrian and regional NGOs to respond to the resurgence of Polio in Northern Syria. The Task Force successfully completed 4 rounds of vaccinations reaching more than 1.4 million children below the age of 5 in Northern and Northeastern Syria. InterAction: SAMS is a also a member if Interaction, whichis an alliance organization in Washington, D.C. of nongovernmental organizations (NGOs). Our 180-plus members work around the world. What unites us is a commitment to working with the world’s poor and vulnerable, and a belief that we can make the world a more peaceful, just and prosperous place – together. The Syria Campaign: In April 2015, SAMS partnered with The Syria Campaign (TSC) and launched Medics Under Fire, a global campaign calling for doctors, health workers, and medical students across the world to stand with Syrian medical workers who have been systematically and repeatedly targeted. NGO Forum: The NGO Forum for NGOs operating in northern Syria is a membership-based coordination body that was established to facilitate information sharing and coordination between NGOs operating from southern Turkey into northern Syria, and is based in Gaziantep, Turkey. Syria INGO Regional Forum (SIRF): SIRF is an INGO-led regional forum based in Amman, Jordan, to give voice to INGOs conducting humanitarian responses in the Syria region. CBRN-TF: SAMS is a founding member of the Chemical, Biological, Radiological, and Nuclear Task Force (CBRN-TF), which was founded in the wake of the August 2013 chemical attacks by 25 NGOs to coordinate and organize the preparedness response and to help prepare medical staff, first responders, and civilians for defense against chemical weapons attack. The Syrian NGO Alliance (SAN): SAN was founded in April 2014 in efforts to coordinate Syrian NGO efforts from Turkey into northern Syria and ensure that the Syrian voice is heard at the highest levels in the coordination structure. The SNA works on capacity building for small Syrian NGOs, advocates for protection mainstreaming, and strengthens coordination with other SNGOs, INGOs, and UN agencies.